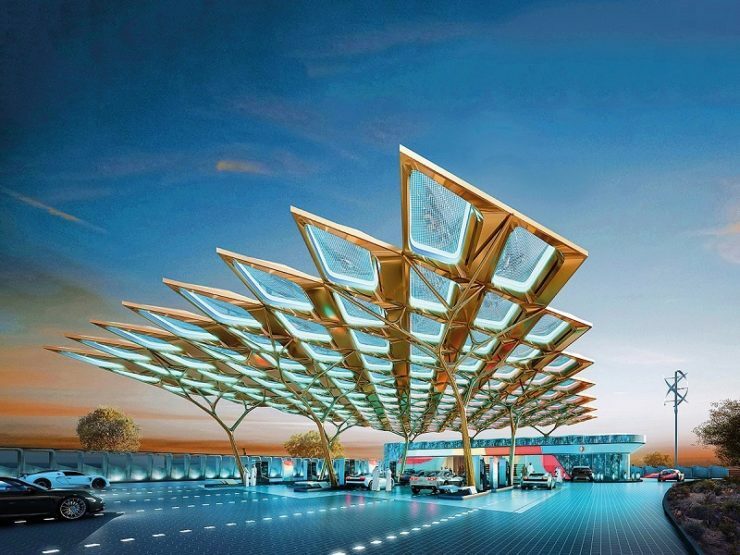 According to *Arabian Business news report, Dubai’s ENOC Group unveiled a concept design for a service station that it plans to develop on the site of Expo 2020 Dubai. The ‘Year of Tolerance’ inspired design is built on an exoskeleton of the Ghaf tree structure, which acts as supporting columns for the carbon fibre canopy - the first time that the extra-strong material will be used to construct an entire structure of a service station canopy. The Ghaf Tree service station will serve the Expo 2020 Dubai fleet during the six months of the Expo. In the legacy phase of Expo, the station will serve District 2020, the urban development planned for the site. The station also includes various technologies such as solar powered autonomous waste water recycling to convert waste water for irrigation, digital displays, integrated electric vehicle (EV) charging stations, multimedia-interactive modern electronic dispensers with cashless payment features, as well as occupation sensors and indication signals at fuelling positions to indicate to customers in queue if there are empty spaces at the dispensers. In addition, the new iconic service station will also implement technologies such as vehicle mapping surface lighting for signage way findings, using lights to mark traffic flow to direct vehicles to the fuelling area, entry and exits to the station. ENOC, which is owned by Dubai government, said the innovative design makes the Ghaf Tree station the first LEED Gold certified service station in the region. The Ghaf tree was selected to represent the UAE’s ‘Year of Tolerance’, which is known for its high sustainability and deep roots that make it resilient even in harsh weather conditions. “The Ghaf tree service station is our way of celebrating the UAE’s rich heritage,” said Saif Humaid Al Falasi, Group GEO, ENOC. “As the integrated energy partner of Expo 2020, we envisioned a concept that is representative of how we have incorporated cutting edge technologies and digital transformation to pave the way for a new generation of service stations in the country and the wider region,” he added. For the first time in the region, ENOC will be implementing wind turbines to generate an average of 30 to 40 Kw (kilowatt) of power from wind energy. Additionally, high performance Photo-Voltaic (PV) solar panels, installed on the canopy of the service stations will generate up to 180KWp of energy per hour, which is about 30 percent more than the average energy required to run a station. The on-grid solar system has net-metering to near zero energy for the service station.